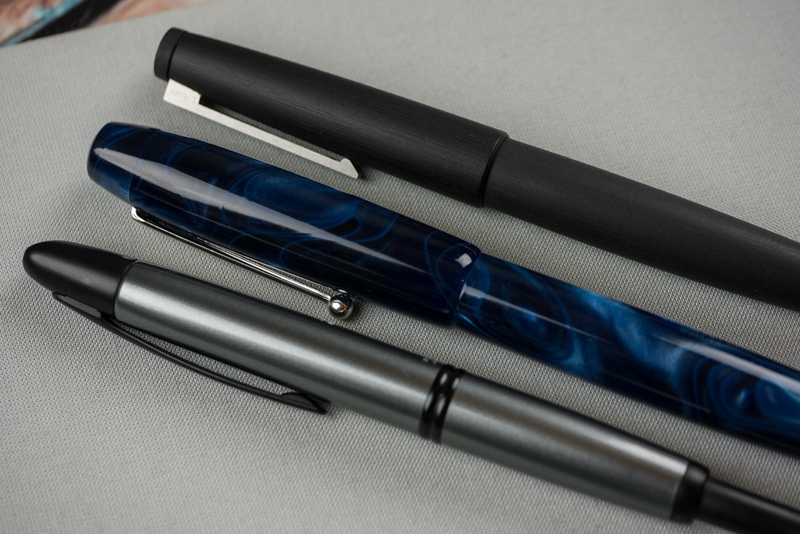 I walked into the Commonwealth Pen Show last September thinking that I knew what I liked in fountain pens. I liked sleek, modern designs. I liked solid colors. I liked pens that I could post. I fancied myself a gold nib snob. I walked out of the show with a pen that checked exactly zero of those boxes, and I haven't stopped using it since. 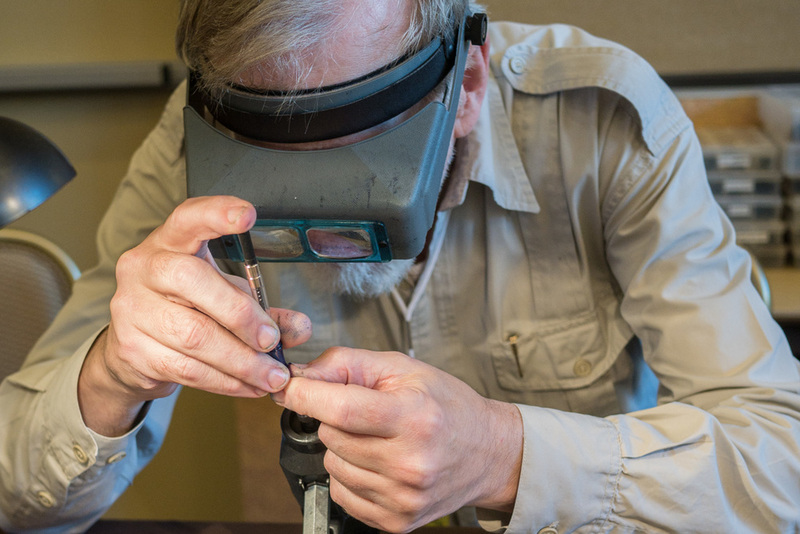 The Edison Collier is part of the Production Line that Edison Pen Company offers through a select group of retailers. Edison also offers a Signature Line of pens that are made to order through consultation with founder Brian Gray. I've mentioned before that I am always on the lookout for the perfect blue black pen. As I was waiting for my turn to have some work done on another pen at Richard Binder's table during the Commonwealth show, the "blue steel" Collier kind of punched me in the face. It's really a gorgeous pen. It's a large pen with curvy lines to it. I think of pens like the Pilot Vanishing Point and the Lamy 2000 as the sports cars of the fountain pen world. In contrast, I see the Edison Collier as a modern highway cruiser with the stylings of a 1960s-era Cadillac. Like many Edison models, the Collier sports a large #6 JoWo nib, which is custom engraved with the Edison logo (a fun nib / lightbulb mashup). There is definitely no mistaking the Collier for anything other than a fountain pen. When I picked up the Collier up for the first time, I was surprised by how light it is. Though it's a large pen, it's made of lightweight acrylic. That said, it feels very solid. The obvious attention to detail that has gone into its design and manufacturing gives it a premium feel. Every bit of threading on the pen is as smooth as butter to twist on and off, yet secures tightly with little thought or effort. The Collier actually changed how I use fountain pens. It doesn't post, which was historically an issue for me. But it's large size actually makes it very comfortable for me to write with unposted. Then, after using the Collier daily for a month or two, I stopped posting my smaller pens as well. It's almost like the Collier helped me shed an artificial hang-up and discover my true preference. A custom ground 0.6mm stub. A stock fine nib tuned to perfection. 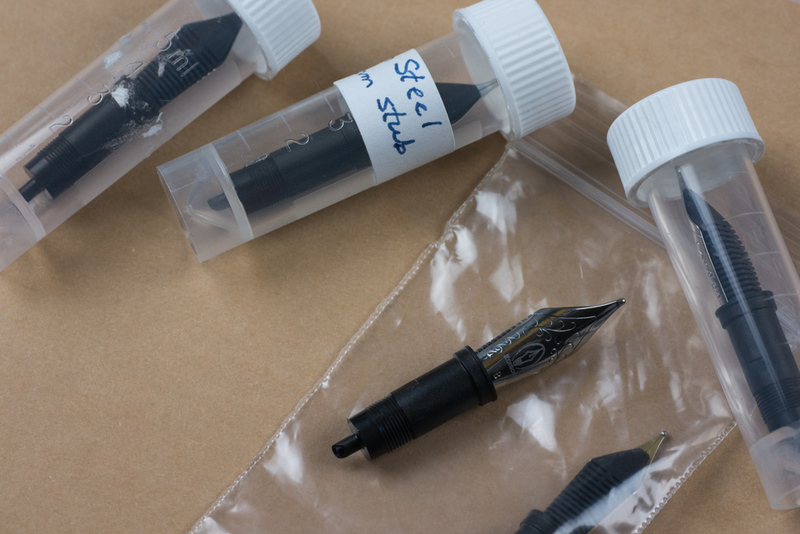 I had been living in gold nib bliss in the proceeding months, but I discovered that high-quality steel nibs can be just as good, particularly if they've been touched by an expert nibmeister. I've since picked up several more steel Edison / JoWo nibs from Richard Binder and Goulet Pens for experimentation, and they've all been great. 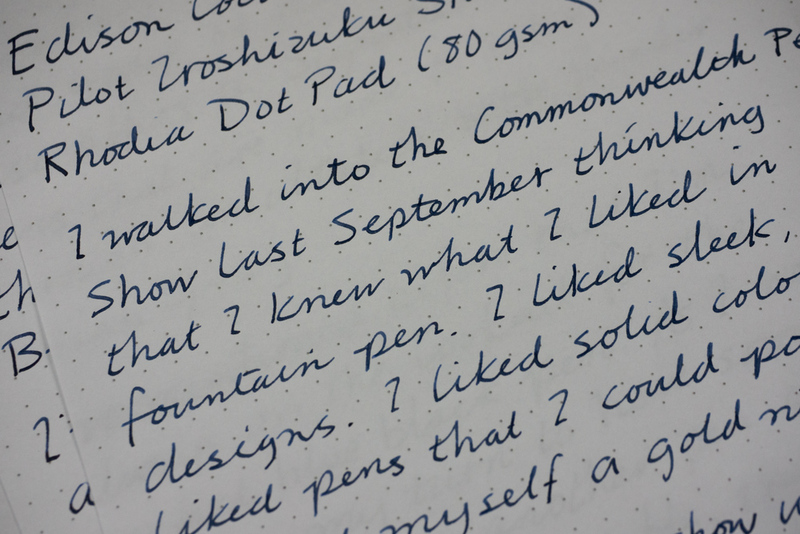 I occasionally have the temptation to invest in a gold JoWo nib as well, but it's hard to convince myself of the need. The steel ones are just that good. 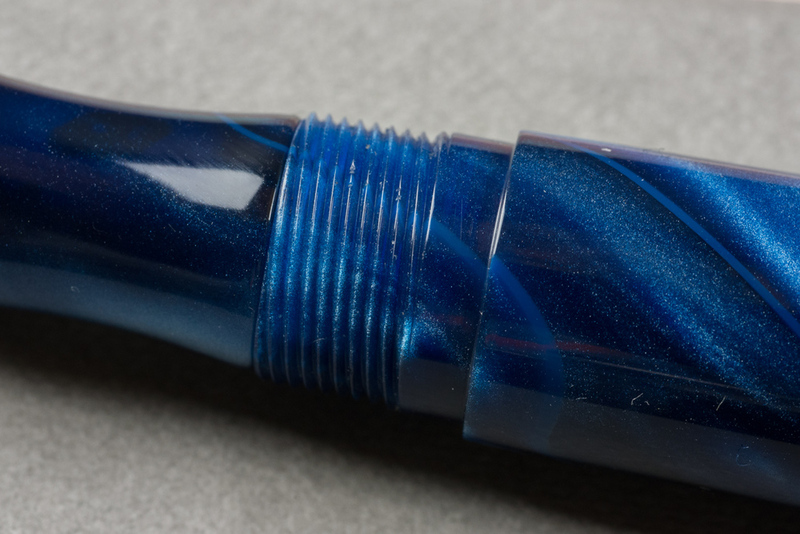 While Edison Pen Company is known for offering some exotic filling mechanisms in its Signature Line pens, the Collier is a standard international cartridge / converter setup. I actually kind of prefer this. Disassembly and cleaning is extremely easy. Removing the nib is also very easy. It unscrews from the grip section for easy cleaning, or to swap out for another nib from my growing collection. The Edison Collier retails for $149 with a steel nib. You can upgrade to an 18-karat gold nib for an additional $125, but I would definitely recommend giving the steel nib a try. It's easy enough to upgrade to a gold nib after the fact. 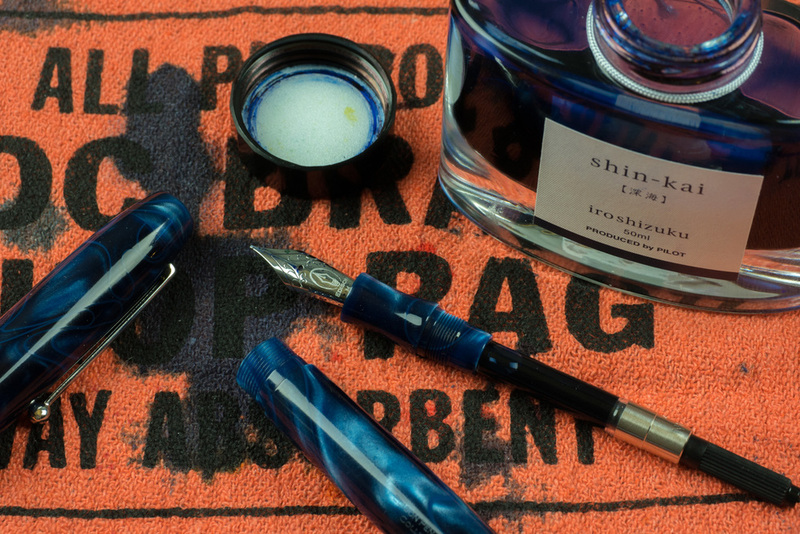 While some may balk at paying "gold nib money" for a steel nib pen, I think the Collier is a great value at this price point. It's hard to enumerate the differences between a mass produced pen and one that comes from the hands of a skilled craftsperson. Edison has a lovely video on their website that shows their manufacturing process in action. The level of care, attention, and precision exhibited in the video really shows up in the finished product. Edison Pen Company was on my radar screen long before my Collier purchase, but I had been planning to wait until I could "do it right" with a fully customized Signature Line pen with a gold nib. 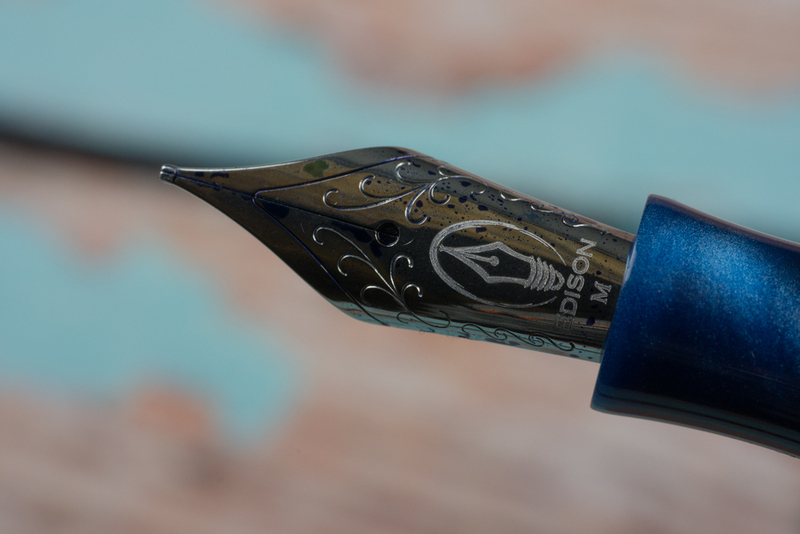 The Collier really opened by eyes to the value that exists in the Edison Production Line, and to the great writing experience that a high-quality steel nib can deliver. 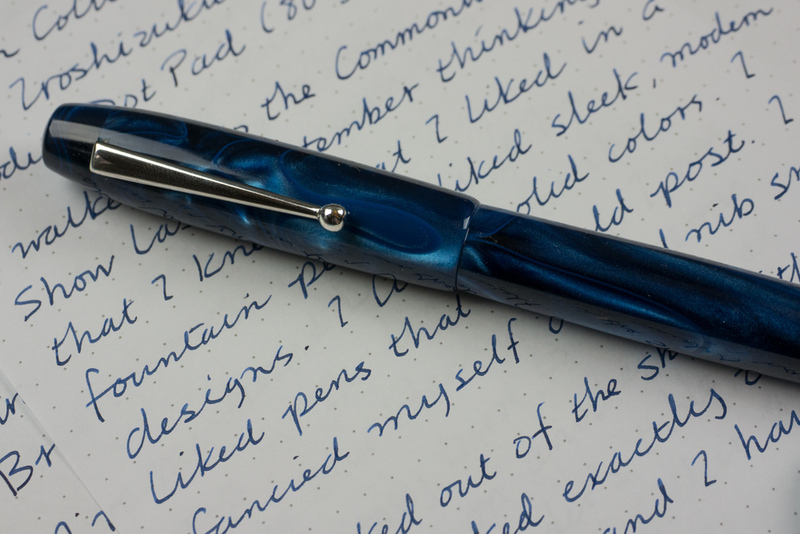 I will still likely purchase a custom Edison pen in the future, but my experience with the Collier really drove home the value of seeing and holding pens in person before buying. The Collier is simply not a pen that I ever would have bought online, but it's now one of my favorites. I will likely wait until I can see and handle the different Edison models and materials at a pen show before starting a custom pen project. Hmm, but maybe I need another Production Line pen to tide me over until then.